Content management system (CMS) is a web tool/application that allows you to manage your site and its content from an internal user interface or dashboard. There are plenty of options when it comes to choosing a CMS for your new website. The most popular content management systems include WordPress, Drupal, Joomla, and PrestaShop (eCommerce sites). These CMSes are open-source, which means you can use them for free. CMSes are open sourced and free to use. To create your new website on these platforms, you’ll need a domain name and a web hosting provider. This setup is called self-hosted. The pros of using a self-hosted content management system are that you have full control over design and functionality. Once you’ve selected the right content management system (CMS) for your website, you need to start thinking of a domain name. This domain will be yourname.com, yourbusiness.com or something similar. When you are choosing a domain name, you want to choose your intended name dot top-level domain. There are hundreds of top-level domains from which to choose. The original top-level domains include .com, .net, .org, .int, .gov, .edu, and .mil. 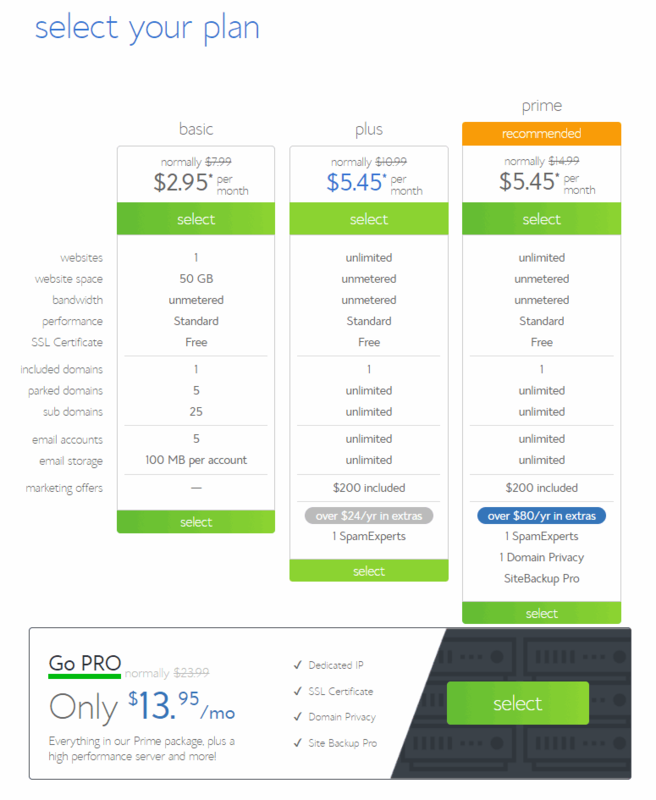 For most websites, the first goal when choosing a domain name is to get the .com top-level domain whenever possible. Why? Because when most people think of website names, they think .com. Facebook.com, Google.com, etc. We recommend Bluehost, which powers over 2 million websites worldwide. They offer an exclusive deal that includes a FREE domain name and a 30-day money-back guarantee. The most popular content management system used on the Internet today, according to BuiltWith, is WordPress. Over 14 million websites use WordPress. The next most popular content management system is Drupal, it’s used on over 2 million websites. After those, you have Joomla, which is used on over 750,000 websites. Over 220,000 online store sites use PrestaShop. Below, we will explain to you how to make a website with these most popular platforms. Each platform is robust and can be used to make any kind of website. Depending on which hosting company you sign up with, you may find it very easy to setup a WordPress site. Primary hosts offer pre-installed or one-click installation of WordPress. While each host has slightly different control panels, the installation process will be similar. Once you sign up for the hosting services, you’ll find an icon somewhere on the host’s control panel that says something like, “One-click installation,” “Install popular software,” or “WordPress installation.” It’s as simple as clicking that icon and follow the step-by-step instructions to install the latest version of WordPress. 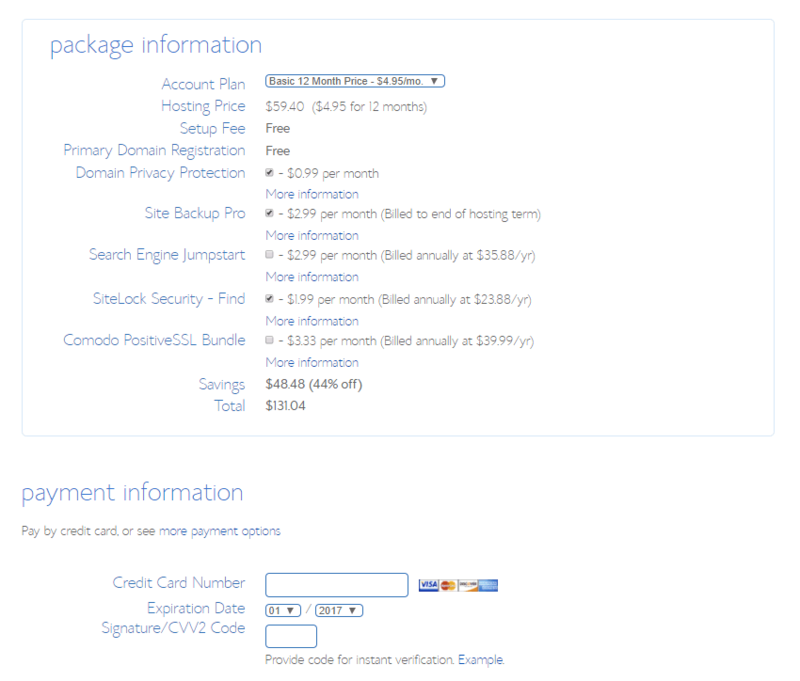 This section provides detailed information to help you signup for Bluehost web hosting account. We also included screenshots of the pages that you need to go through. If you prefer to use other web hosting company, the process might be slightly different but most of the steps should be very similar. After you log in to your newly created account, Bluehost will ask you to select a WordPress theme for your website. A theme will make your website appear more beautiful and appealing to your visitors. In case you don’t particularly like any of the themes offered by Bluehost, you can choose any of the themes on WordPress.org and seamlessly install it on your new website. After you pick a theme, your website will be automatically set up and ready for you to start your online journey. To create your first website, you have to log in to your WordPress dashboard. 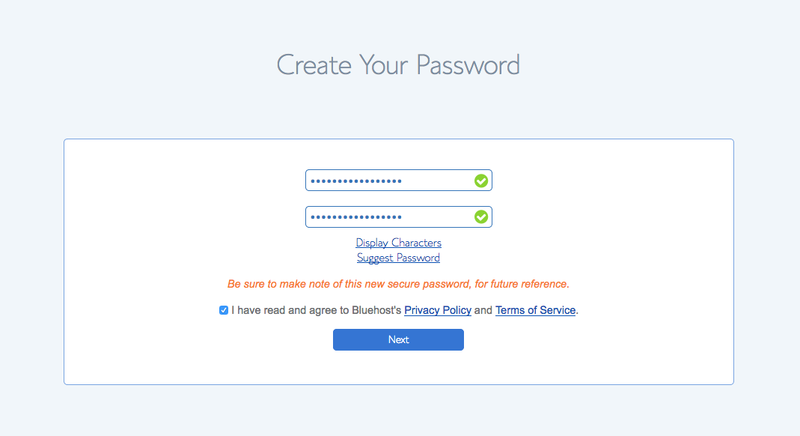 After you log in and access your WordPress dashboard, a Bluehost welcome message will pop up. This welcome message is at the same time Bluehost’ website wizard, designed to help you by guiding you through the website creation process. If you feel confident enough to do this on your own, feel free to skip this step. Finally, you will get to your WordPress dashboard screen, one step away from launching your site. Bluehost offers a number of useful tools you can use to kickstart your blog, create new posts with ease, and customize your blog. To access them, all you need to do is to click on the Bluehost button located in the upper left corner of your screen. After you are done, you can get your fabulous site online by clicking on the blue “Launch” button. The click on the “Launch” button will be followed by a dialog box, where you get to choose your website title and name. You will also be able to add a website description to help people and search engines understand what your website is about. There you go, your new website is now live and you can start sharing your glamorous content on it whenever you want. Once you’ve installed WordPress on your domain name, by default, you’ll get a basic automatically selected theme on your site (currently it’s Twenty Nineteen theme). This theme and your website design can be easily changed by choosing from more than 1500 free themes available in WordPress. It can be done under the Appearance menu item by selecting Themes subcategory. In this category, you can choose a new theme from the WordPress repository. WooCommerce is the most popular WordPress plugin which is designed to serve you as your online store. The plugin is completely free, but it features many extensions and dedicated themes which may be free or can come in the form of premium plugins. This eCommerce system allows you to create a shop, modify items, manage paying and shipping methods, and much more. Because of all the extensions which make the plugin easy to use, WooCommerce is in charge of over 30% of all online stores. With WordPress and WooCommerce, creating a simple online store has never been easier. You can prepare everything in just a few days, and the good thing is that you don’t have to know much about the platform. Still, creating a good online store that your customers will happily visit requires more effort from you. You will have to design your store, add all the necessary features and entice visitors to become customers. Note 1: The reason that WordPress is so widely used is because it’s so versatile. WordPress is user-friendly, so small businesses can use it without investing too much time into learning how it works. But WordPress is robust enough to be used even for large corporate or commercial websites. Note 2: Because it is so prevalent, there are a lot of developers, programmers, and coders who work with WordPress, and there are a lot of tech-savvy people who continually design themes, eCommerce plugins, and new features to add to your WordPress site. Joomla was released to the public in August 2005. With each passing year, it has continued to grow its presence as one of the most powerful content management systems. As a free and open-source CMS, Joomla is not only simple to install (one-click install option is available with the most hosting providers) but also provides the ability to make customizations based on the user’s specific needs. Written in PHP, Joomla includes a variety of features that have helped grow its popularity. These include blogs, news flashes, polls, RSS feeds, and page caching. While Joomla is not as popular as WordPress, it is the second-most popular choice. Powerful, simple to use menu creation tool. That is just one of the many reasons why Joomla has made the top. Plenty of community support This holds true for other platforms, but Joomla is right up there regarding this benefit. Extensions. There are approximately 8,000 extensions available, that can help you to customize your site. One click installation, the recommended option and can be completed within minutes. Manual installation, which takes anywhere from 20 to 30 minutes to complete. Once the installation is complete, you now have a new website. It may not be much to look at right now, but remember that you can customize every element of your site. From the layout to the color to the menus, you have the power to make as many changes as you want. With Joomla, you will find that most of your activity as the admin of the site will be focused on the “Control panel”. To login to your control panel, add the word /administrator/ to the URL of your site. For example, YourWebsite.com/administrator/. Control panel is easy to understand, simple to navigate, and full of all the information you require to make changes, add content, and get an overall idea of where your site stands. Left menu bar. Here you will find Content, Structure, Users, Configuration, Extensions, and Maintenance. Header menu. It provides access to many of the same areas as the left sidebar, as well as a drop-down for System, Menus, Components, and Help. Main content area. Finally, the main content area shows Logged-In Users, Popular Articles, and Recently Added Articles. After you set up a basic website, it is time to consider your options for customizing each page. To get started, head to the “Extensions” tab in the header menu and drop down to “Template Manager”. It is here that you can dive deeper into the template that is installed, while also considering other layouts that may suit your website. If you click on “My Default Style” and then the “Options tab”, you can change the text and background colors, upload a new logo and add fonts. The “Module Manager” is also important from a customization standpoint. It allows you to add, delete, and edit modules. If you click on “Add New Article”, for example, you will be taken to the page where you can add your content, choose your publishing options, and click “Save”. There are more features on this page, such as publishing an image and links, so be sure to experiment with each one. Note: For businesses which are set for hosting a lot of articles, and don’t want many features, Joomla can certainly be the CMS of choice. It gives you the power to create a website quickly, and with a bit of training, offers the shortest development cycle in the CMS arena. If you’re looking for a content management system that’s more robust than WordPress but still gives you a lot of free options for theme and modules, consider working with Drupal. Like WordPress, it’s a free content management system that lets you build a website quickly. But Drupal is more robust and allows greater flexibility than WordPress. Drupal is more challenging to use than WordPress or Joomla, but with many free plugins and themes, it’s an excellent choice for a larger or more robust website that’s going to require greater functionality than a simple one-page site. Drupal got its name from a misspelling. Many of the traditional hosting providers offer a one-click installation of Drupal. And installation can be completed in as little as ten minutes using the single-click installer provided by your web host. If you’re planning to use some custom setup options or your host doesn’t offer the one-click option, you’ll need to install Drupal manually. Instructions are available from Drupal here. Where is Drupal most popular? The dashboard gives administrators a customizable overview of relevant site information. You can add and remove items from the panel, or you can disable the dashboard completely. Content tab lets you find, manage, and create new pages. Also, lets you manage comments. Structure tab lets you edit blocks, define new content types, configure menus, administer tags, and configure some contributed modules. Appearance tab lets you switch between themes, install themes, and update existing themes. People tab lets you manage existing users, or create new user accounts. Modules tab lets you update, enable, disable, and install new modules. Configuration tab allows you to configure the settings for various functionality, including some modules: user settings, general site information, and other general admin settings. Reports tab lets you display information about site security, necessary updates, and information on site activity. Help tab displays links with the information and online documentation about the functionality of all of the modules installed on the site. The right side includes user-specific items such as user account and logs out. Shortcuts sub menu bar is where you can add the most commonly used menu items. The Appearance menu item allows you to select a new theme or to customize your existing theme. Like WordPress, Drupal allows you to set a different theme for your front and back ends. To install a new theme, click on the text at the top left-hand corner of the lightbox that says, “Install new theme”. Installing a new theme on Drupal is slightly more challenging than on WordPress. Once you’ve found your new theme, you can download it in a compressed (.zip or tar.gz) format. When you’ve clicked on the Install new theme, you’ll then select your compressed file using the “Upload a module or theme” section of the lightbox. Basic settings can be altered by using the Settings tab of the Appearance lightbox. It allows you to determine whether a logo, site name, secondary menu, and other items will be displayed on your site. Note: Like many forms of software, the more options you have, the harder it can be to figure out how to use it. Drupal has many options to allow you to have maximum customization, but it does take some time to learn how to use it effectively. You can give Drupal a shot, and take some time to play with its various features and functions, and you’ll have a unique and beautiful website in no time. If you want to create an eCommerce store, you will need to choose a content management system that will help you with selling products as opposed to solely serving posts and pages. It can be challenging to know where to begin navigating with so many options available. For many people wanting to sell online, Prestashop offers a viable solution. It’s an open-source shopping cart software designed to give businesses the flexibility to build a functioning online store. Just like with regular CMSes, Prestashop can be installed manually or with the easy one-click install process. Most hosting providers offer one-click install option that we recommend, and you should easily find it within your host’s control panel. Customize your shop’s look and feel. Add product to your catalog. We recommend you to install the default free theme, but you can always change it once you get familiar with the platform. Once theme installation is complete, and you are done with the setup tutorial, you can get back to your main admin area. This panel is the center of store administration. It consists of two main parts, left side menu and middle section. The left side menu is where you will find all of your admin options, and where most of your creative effort will be focused. The middle section displays all of your store’s important information such as the number of orders completed, etc. Dashboard tab lets you get back to the main page of your admin panel. The catalog is the heart of your shop, where you will add products, create categories, set up carriers and suppliers, etc. Orders will let you see orders with the invoices and handle merchandise returns, credit slips, and pre-order customer service, among other things. Customers tab lets you access all the information about your clients, edit their addresses, apply special discounts, and handle customer service. Price rules tab enables you to create vouchers and price reductions through a set of rules. Modules tab extends the power and usefulness of your shop. More than a hundred modules are available by default, and much more are available to buy on the Add-ons marketplace. Shipping tab lets you handle everything related to carriers and shipping costs, as well as marketing. Localization tab helps you customize your shop with local values, such as language and translation, currency, units, taxes and tax rules, and geographical entities. Preferences tab lets you edit just about any of its behaviors using the full-featured preferences. Advanced parameters tab contains links to specific tools and informational pages, such as the Web service settings, the database backup tool, the performance page, and more. Administration tab lets you set the admin panel itself: the content of the Quick Access menu, the employee’s list and permissions, the menu order, and more. Stats tab gives you access to all the statistics and graphics that are gathered and generated. Prestashop has done a great job at creating documentation that covers the basics. There are separate guides for designers, developers, and merchants. When it comes to changing the look of your online store, Prestashop has more than 3,000 themes and modules. The company offers tips for installing a theme as well as a demo store to enable users to preview a theme. While users have to pay for add-ons such as social media and PayPal integration, there are out of the box features that command user attention. Tools such as sales tracking, wish lists, unlimited currency support, one-page checkout, international shipping, MailChimp, and Olark make it easy to customize your website and do retail business. Note: While Prestashop has its shortcomings such as expensive modules and limited marketing opportunities, it proves itself as a powerful adversary to other shopping cart solutions. For the backend, the dashboard gives you everything you need to manage your business. It supports all the main shipping carriers, and comes with more than ten payment methods, giving you the flexibility to meet the demands of different customers.